Operation Big Girl Bed is nearly complete. We swapped the double guest bed for this wicker set from a recent yard sale. It gives us just enough floor space for 2 kids. Baby boy's clothes are folded in the tall dresser. 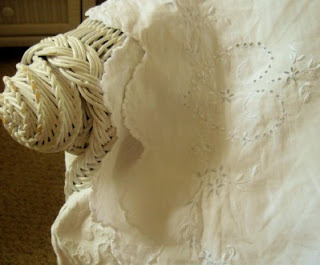 I repurposed the vintage linens for the daybed--one benefit of using an old unfitted coverlet and dust ruffle. Everything goes with white, and kid stains are easily lifted with Biz or bleach. I don't have any matching patterns--only the pink-and-green stripe valances I found at Goodwill. My aunt passed along this estate sale toile chair. She uses its ottoman to climb into bed. 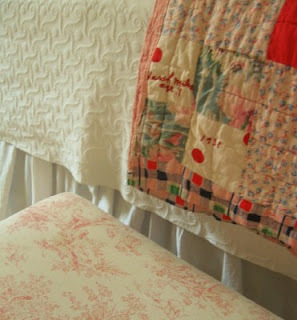 The vintage quilt helps tie everything together. Can you read the embroidery? Sarah Miles, Age 7, 1931. VERY nice and I love the quilt!! 1931 awesome!! What a great quilt! I like the toile ottoman too. So lovely! You really have a knack for mixing found items in a way that's so much warmer than the store bought everything as a set packages. Just perfect! And, so restful! Are you keeping the pink/green valances? Will they just be in Elise's "half" of the room? Are you doing all white for the new baby boy? Anxious to see his space. I'm sure it is a challenge to figure out a decor that is appropriate for a boy and a girl without getting rid of the existing pink stuff. Can't wait to see what you come up with. I'm not normally a big fan of wicker, but I love this! :) And love the toile. Wow, that quilt is a gem! The bedroom looks wonderful. What a happy room. What a nice room and quilt. Looks lovely. My friend is having their first baby in December do you have suggestions for a gift? I's like to give something special. I love old quilts too. One of my from childhood is so beat up that I can't use it on the bed anymore. Now I put it under the Christmas tree for a homespun skirt. OH my stars!! I love that wicker bed! I must see more of it... And the quilt! Gorgeous! Goodness, Meredith. You must have pure elegance flowing in your blood. You have such a gift for throwing together a lovely, frugal, assortment and making it all look like blue blood casual old money. I Love the quilt and chair together in that photo. And the coverlet is sweet. It's funny--after I look at the photos, I can clearly see I need more green to tie Elise's side of the room to the crib. The green accent of a tassle, pillow or both. Nice. You are so talented the room is lovely. That room is going to be just perfect mostly because of all the love you have put into it. Oh, that is a lovely room for the children! 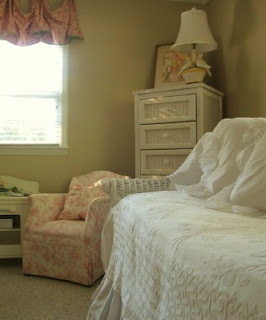 I like that it is so soothing and restful and that it is not your typical catalog, cookie cutter child's room. The wicker is absolutely gorgeous. What a find that was!